Support for ClientLogin, OAuth 1.0 (3LO1), AuthSub, and OpenID 2.0 has ended, and the shutdown process has begun. Clients attempting to use these services will begin to fail and must be migrated to OAuth 2.0 or OpenID Connect immediately. To migrate a sign-in system, the easiest path is to use the Google Sign-in SDKs (see the migration documentation). Google Sign-in is built on top of our standards-based OAuth 2.0 and OpenID Connect infrastructure and provides a single interface for authentication and authorization flows on Web, Android and iOS. To migrate server API use, we recommend using one of our OAuth 2.0 client libraries. We are moving away from legacy authentication protocols, focusing our support on OpenID Connect and OAuth 2.0. These modern open standards enhance the security of Google accounts, and are generally easier for developers to integrate with. 13LO stands for 3-legged OAuth where there's an end-user that provides consent. In contrast, 2-legged (2LO) correspond to Enterprise authorization scenarios such as organizational-wide policies control access. Both OAuth1 3LO and 2LO flows are deprecated, but this announcement is specific to OAuth1 3LO. All of us is greater than any single one of us. That’s why we open sourced the Cardboard viewer design on day one. And why we’ve been working on virtual reality (VR) tools for manufacturers and developers ever since. We want to make VR better together, and the community continues to inspire us. For example: what began with cardboard, velcro and some lenses has become a part of toy fairs and art shows and film festivals all over the world. There are also hundreds of Cardboard apps on Google Play, including test drives, roller coaster rides, and mountain climbs. And people keep finding new ways to bring VR into their daily lives—from campus tours to marriage proposals to vacation planning. It’s what we dreamed about when we folded our first piece of cardboard, and combined it with a smartphone: a VR experience for everyone! And less than a year later, there’s a tremendous diversity of VR viewers and apps to choose from. To keep this creativity going, however, we also need to invest in compatibility. 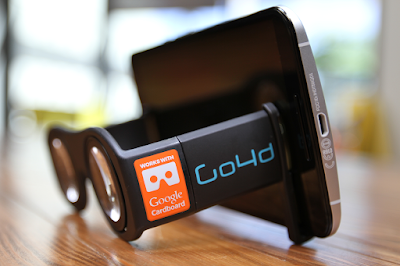 That’s why we’re announcing a new program called Works with Google Cardboard. 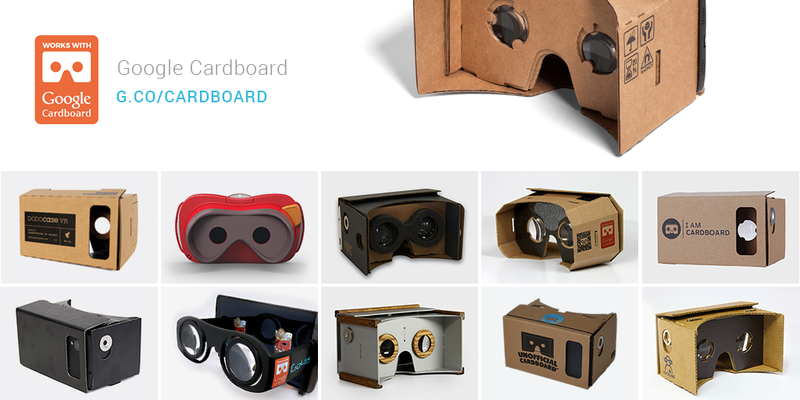 At its core, the program enables any Cardboard viewer to work well with any Cardboard app. And the result is more awesome VR for all of us. These days you can find Cardboard viewers made from all sorts of materials—plastic, wood, metal, even pizza boxes. 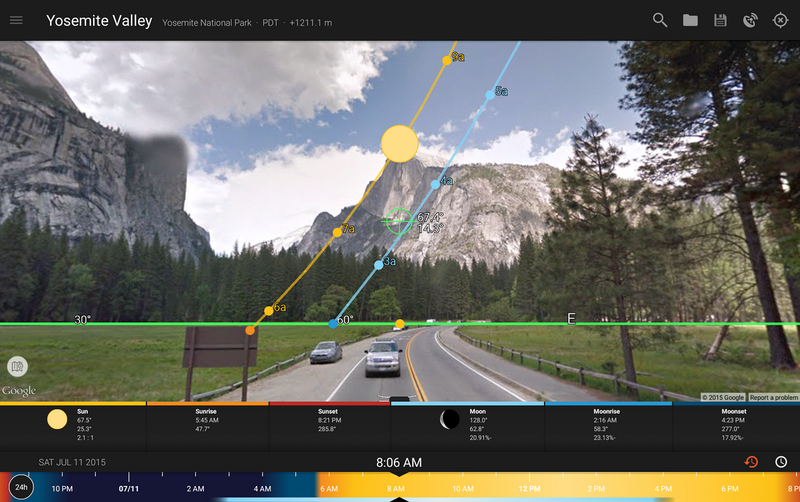 The challenge is that each viewer may have slightly different optics and dimensions, and apps actually need this info to deliver a great experience. That’s why, as part of today’s program, we’re releasing a new tool that configures any viewer for every Cardboard app, automatically. As a manufacturer, all you need to do is define your viewer’s key parameters (like focal length, input type, and inter-lens distance), and you’ll get a QR code to place on your device. Once a user scans this code using the Google Cardboard app, all their other Cardboard VR experiences will be optimized for your viewer. And that’s it. Starting today, manufacturers can also apply for a program certification badge. This way potential users will know, at a glance, that a VR viewer works great with Cardboard apps and games. Visit the Cardboard website to get started. We’ve explored these questions (and many more) since launch, and today we’re sharing our initial learnings with the developer community. Our new design guidelines focus on overall usability, as well as common VR pitfalls, so take a look and let us know your thoughts. Of course, we want to make it easier to design and build great apps. So today we're also updating the Cardboard SDKs for Android and Unity—including improved head tracking and drift correction. In addition, both SDKs support the Works with Google Cardboard program, so all your apps will play nice with all certified VR viewers. 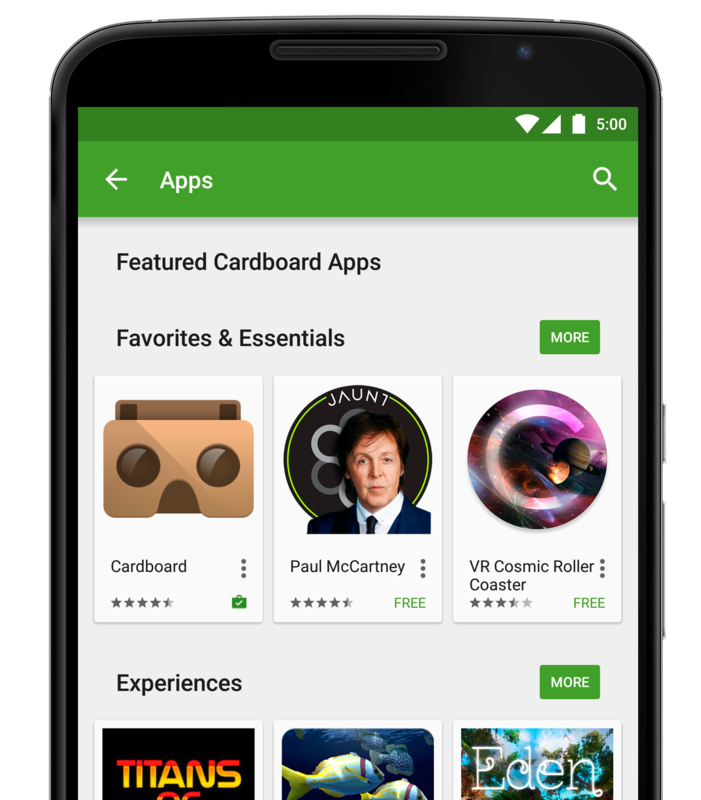 The number of Cardboard apps has quickly grown from dozens to hundreds, so we’re expanding our Google Play collection to help you find high-quality apps even faster. New categories include Music and Video, Games, and Experiences. Whether you’re blasting asteroids, or reliving the Saturday Night Live 40th Anniversary Special, there’s plenty to explore on Google Play. Today’s Works with Google Cardboard announcement means you’ll get the same great VR experience across a wide selection of Cardboard viewers. Find the viewer that fits you best, and then fire up your favorite apps. Most of today’s VR experiences focus on what you see, but what you hear is just as important. That’s why we’re excited to welcome the Thrive Audio team from the School of Engineering in Trinity College Dublin to Google. With their ambisonic surround sound technology, we can start bringing immersive audio to VR. In addition, we’re thrilled to have the Tilt Brush team join our family. With its innovative approach to 3D painting, Tilt Brush won last year’s Proto Award for Best Graphical User Interface. We’re looking forward to having them at Google, and building great apps together. Ultimately, today’s updates are about making VR better together. Join the fold, and let’s have some fun. Real-time collaboration is a powerful feature for getting work done inside Google docs. We extended that functionality with the Realtime API to enable you to create Google-docs style collaborative applications with minimal effort. Integration of the API becomes even easier with a new in memory mode, which allows you to manipulate a Realtime document using the standard API without being connected to our servers. No user login or authorization is required. This is great for building applications where Google login is optional, writing tests for your app, or experimenting with the API before configuring auth. Finally, we have refreshed the developer guides to make it easier for you to learn about the API as a new or advanced user. Check them out at https://developers.google.com/drive/realtime. For details on these and other recent features, see the release note. Fun Propulsion Labs at Google* is back today with some new releases for game developers. We’ve updated Pie Noon (our open source Android TV game) with networked multi-screen action, and we’ve also added some delicious new libraries we’ve been baking since the original release: the Pindrop audio library and the Motive animation system. Got an Android TV and up to 4 friends with Android phones or tablets? You’re ready for some strategic multi-player mayhem in this updated game mode. Plan your next move in secret on your Android phone: will you throw at an opponent, block an incoming attack, or take the risky approach and wait for a larger pie? Choose your target and action, then watch the Android TV to see what happens! We used the NearbyConnections API from the most recent version of Google Play Games services to easily connect smartphones to your Android TV and turn our original Pie Noon party game into a game of turn-based strategy. You can grab the latest version of Pie Noon from Google Play to try it out, or crack open the source code and take a look at how we used FlatBuffers to encode data across the network in a fast, portable, bandwidth-efficient way. Pindrop is a cross-platform C++ library for managing your in-game audio. It supports cross compilation to Android, Linux, iOS and OSX. An early version of this code was part of the first Pie Noon release, but it’s now available as a separate library that you can use in your own games. Pindrop handles loading and unloading sound banks, tracking sound locations and listeners, prioritization of your audio channels, and more. SDL Mixer is used as a backend for actually playing the audio. The loading of data and configuration files is handled by our serialization library, FlatBuffers. Our own math library, MathFu, is used for a number of under-the-hood calculations. You can download the latest open source release from our GitHub page. Documentation is available here and a sample project is included in the source tree. Please feel free to post any questions in our discussion list. The Motive animation system can breathe life into your static scenes. It does this by applying motion to simple variables. For example, if you’d like a flashlight to shine on a constantly-moving target, Motive can animate the flashlight so that it moves smoothly yet responsively. Motive animates both spline-based motion and procedural motion. These types of motion are not technically difficult, but they are artistically subtle. It's easy to get the math wrong. It's easy to end up with something that moves as required but doesn't quite feel right. Motive does the math and lets you focus on the feeling. Motive is scalable. It's designed to be extremely fast. It also has a tight memory footprint -- smaller than traditional animation compression -- that's based on Dual Cubic Splines. Our hope is that you might consider using Motive as a high-performance back-end to your existing full-featured animation systems. This initial release of Motive is feature-light since we focused our early efforts on doing something simple very quickly. We support procedural and spline-based animation, but we don't yet support data export from animation packages like Blender or Maya. Motive 1.0 is suitable for props -- trees, cameras, extremities -- but not fully rigged character models. Like all FPL technologies, Motive is open source and cross-platform. Please check out the discussion list, too. What’s Fun Propulsion Labs at Google? You might remember us from such Android games as Pie Noon, LiquidFun Paint, and VoltAir, and such cross-platform libraries as MathFu, LiquidFun, and FlatBuffers. Want to learn more about our team? Check out this recent episode of Game On! with Todd Kerpelman for the scoop! The holiday spirit is about giving and though we’re early into April, we’re still in that spirit. 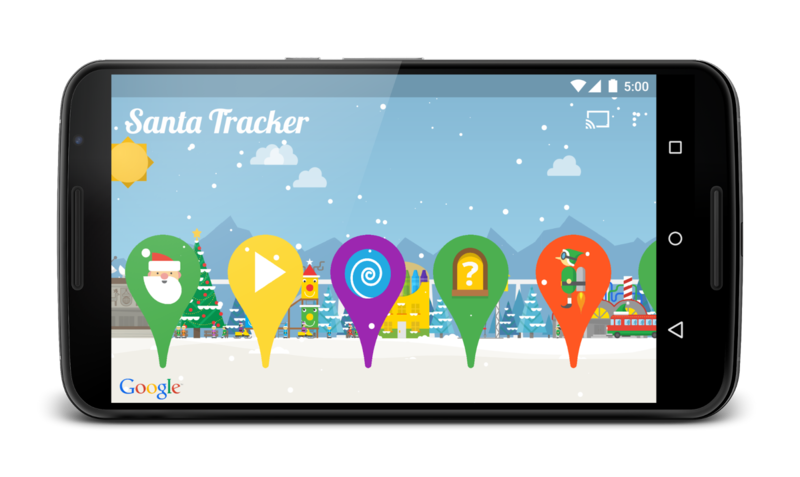 Today, we’re announcing that Google's Santa Tracker is now open source on GitHub at google/santa-tracker-web and google/santa-tracker-android. Now you can see how we’ve used many of our developer products to build a fun and engaging experience that runs across the web and Android. 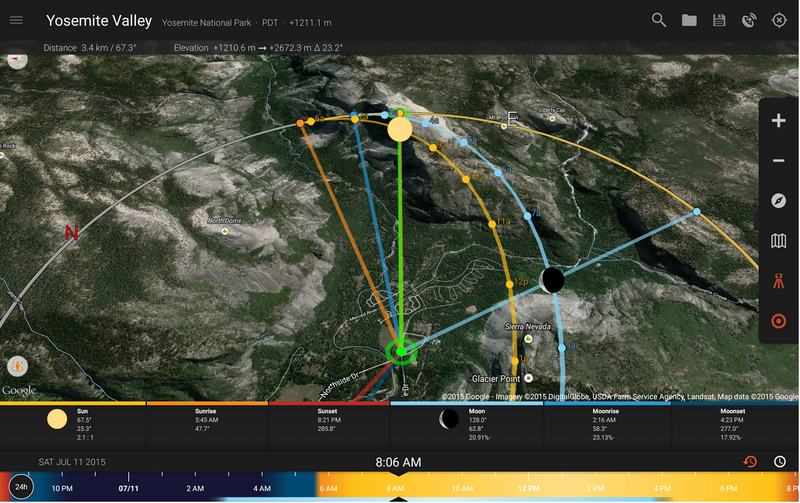 Santa Tracker isn’t just about watching Santa’s progress as he delivers presents on December 24. Visitors can also have fun with the winter-inspired games and an interactive North Pole village while Santa prepares for his big journey throughout the holidays. Below is a summary of what we’ve released as open source. 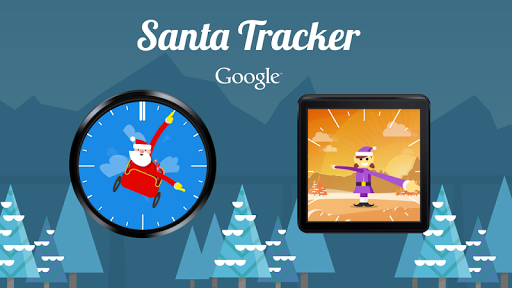 The Santa Tracker Android app is a single APK, supporting all devices running Ice Cream Sandwich (4.0) and up. The source code for the app can be found here. Santa’s village is a canvas-based graphical launcher for videos, games and the tracker. In order to span 10,000 pixels in width, the village uses the Android resource hierarchy in a unique way to scale graphics without needing assets for multiple density buckets, thereby reducing the APK size. 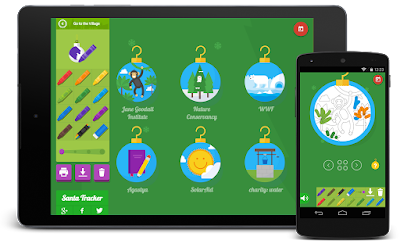 Games on Santa Tracker Android are built using a combination of technologies such as JBox2D (gumball game), Android view hierarchy (memory match game) and OpenGL with a purpose-built rendering engine (jetpack game). To help with user engagement, the app uses the App Indexing API to enable autocomplete support for Santa Tracker games from Google Search. This is done using deep linking. The custom watch faces on Android Wear provide a personalized touch. Having Santa or one of his friendly elves tell the time brings a smile to all. Building custom watch faces is a lot of fun but providing a performant, battery friendly watch face requires certain considerations. The watch face source code can be found here. 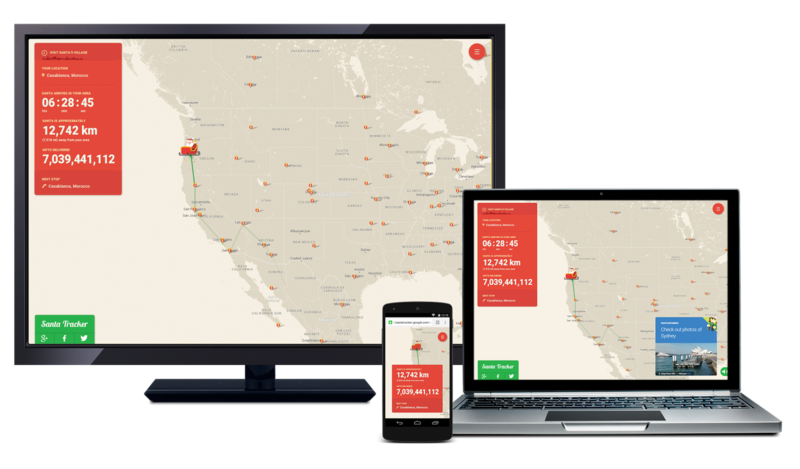 Santa Tracker uses notifications to let users know when Santa has started his journey. The notifications are further enhanced to provide a great experience on wearables using custom backgrounds and actions that deep link into the app. 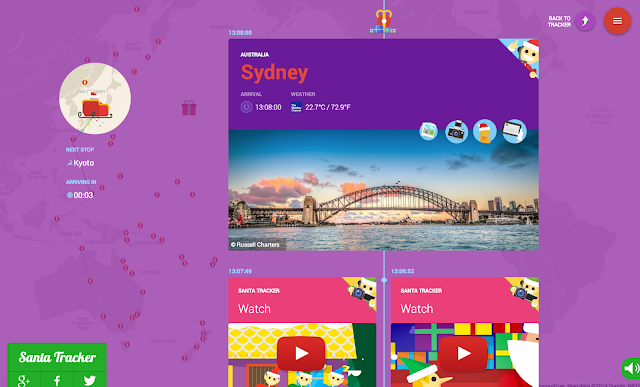 Santa Tracker on the web was built using Polymer, a powerful new library from the Chrome team based on Web Components. Santa Tracker’s use of Polymer demonstrates how easy it is to package code into reusable components. Every scene in Santa's village (games, videos, and interactive pages) is a custom element, only loaded when needed, minimizing the startup cost of Santa Tracker. Santa believes in mobile first; this year's experience was built to be optimized for the mobile web, including a fully responsive design, touch gesture support using Polymer, and new features like meta-theme color and the application manifest for add to homescreen. To provide exceptional localization support, a new i18n-msg component was built, a first for Web Components. Modeled after the Chrome extension i18n system, it enables live page-refresh for development but has a build step for optimization. Now that the source code is also available, developers can see many of the parts that come together to make Santa Tracker. We hope that developers are inspired to make their own magical experiences.